At the Cheek Law Firm, LLC, we understand that experiencing a personal injury or a serious illness can be a major struggle. That is why we make it our goal to help you get the financial compensation and the justice that you deserve. We put the time and energy, along with our skillset, to great use in order to properly handle your case. We not only want you to get your just financial compensation, but we also want you to experience the closure and relief that goes along with getting the justice that you deserve. In order to achieve these goals, we have an approach that is efficient, thorough, and unique from other law firms in the area. We will consult with you initially to discuss your case. This consultation is completely free. If it is a good match, then we will meet with you in person. This is to get further details and discuss your case at length. We will prepare your case for trial, educating you on our approach so that you are comfortable with the plan of action. We will take the necessary legal steps to litigate your case. If a settlement is reached, then there is no need to proceed further. If not, then we will bring your case to trial, and we will argue on your behalf until you get the justice you deserve. “We will handle your case with all of the care and attention it deserves, and we will not stop until complete resolution is reached." We know that personal injury lawsuits can be very emotional and difficult. That is why we make sure that we meet with you in person and get to know you. You will be able to have a much better understanding of us, and you will be able to develop a sense of trust with our firm while we handle your case. Also, all of the cases we take on at the Cheek Law Firm, LLC are on a contingency basis. This means that we will not charge by the hour, and we will only take a percentage of the settlement if we win the case. 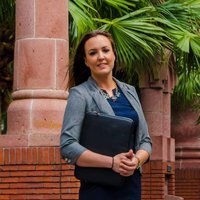 Lindsey Cheek is the founding member and chief attorney at Cheek Law Firm, LLC. She got her J.D. from the South Texas College of Law and her B.B.A. from the University of Houston. Ms. Cheek passed the Bar admissions for the State of Louisiana, the State of Texas, the State of Pennsylvania, and the Northern District of Texas. She is a skilled and experienced lawyer who has recovered millions of dollars in settlements for her clients.